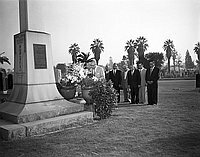 Mr. Okusa of Japan, accompanied by six other men, pay respectsat the World War II Nisei memorial at Evergreen Cemetery in Boyle Heights, Los Angeles, California, November 6, 1955. Man in light colored suit and eyeglasses places a wreath of flowers at base of one memorial. Seven men pose in front of base of War memorial. Typed on original negative envelope: Okusa, Mr. -- Japan -- Messiah.